Or we should rather say a fire-bearing victory-bearer. 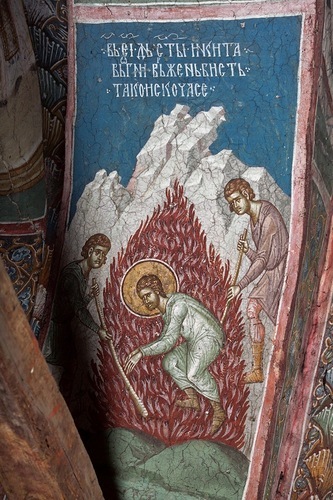 On the fifteenth, Niketas was cast into the furnace. At that time, intense warfare arose among the Goths. At the head of one hostile side stood Prince Athanarichus, a vehement pagan and a hater of Christians. At the head of the other stood Frigentus, who was a Christian. In the bloody clash of the armies, Athanarichus was victorious, and Frigentus was forced to flee to Constantinople. But soon Frigentus returned to his homeland, reinforced by the fresh troops afforded him by the Emperor Valens (364-378). Frigentus commanded that the image of the Holy Cross be made on the standards of his army, as once did Emperor Constantine the Great. A second bloody battle took place, and this time Frigentus was victorious. But Athanarichus, with a small group of adherents, was saved by flight. After Frigentus' victory, favorable times ensued for Christianity. Bishop Theophilus' successor, Bishop Urphilus (311-383), created the Gothic alphabet and translated many spiritual books from Greek into Gothic, including the Holy Scriptures. 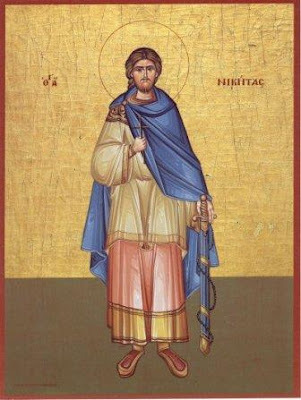 Saint Niketas, by his preaching and his pious life, greatly assisted the confirmation of the Christian faith among the Goths and converted many. 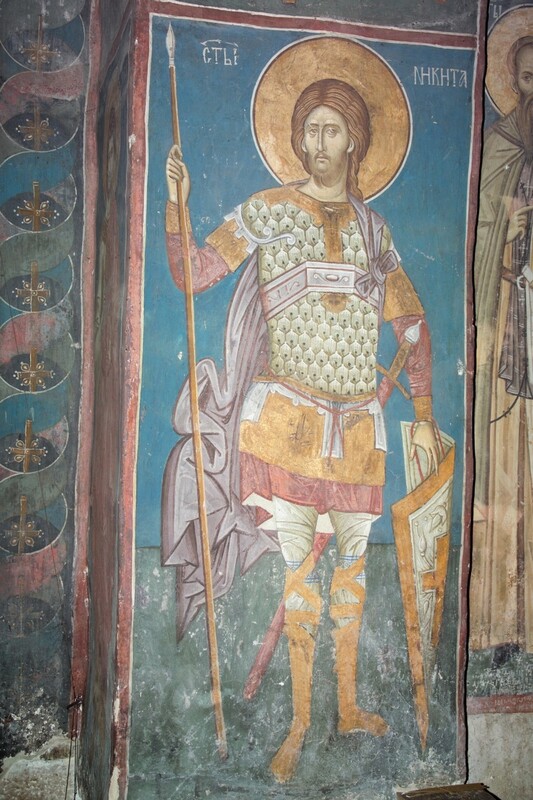 A close friend of St. Paulinus of Nola, Niketas became bishop of Remesiana in Dacia (modern Romania and Yugoslavia) and was noted for his successful missionary activities, especially among the Bessi, a race of marauders, which Paulinus commemorates in a poem. Niketas wrote several dissertations on Faith, the Creed, the Trinity, liturgical singing, and is believed by some scholars to be the author of Te Deum. 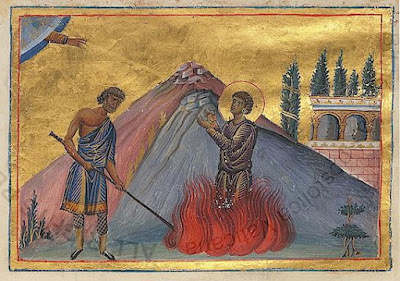 We know little of Niketas himself beyond the fact that on at least two occasions, he made his way from a country which Paulinus regarded as a wild region of snow and ice to visit his friend at Nola in Campania. Saint Jerome also speaks very appreciatively of his work in converting the people of Dacia. After a few years, Athanarichus returned to his homeland with a numerous army, and intense warfare again started up among the Goths. Having overcome Frigentus, Athanarichus raised up a cruel persecution against the Christians. Niketas, having become a spiritual leader of the Christian Goths, denounced Athanarichus for godlessness and cruelty. He called on the faithful to be firm and not to fear martyrdom. Soon Niketas was seized and given over to cruel tortures. His mind was unceasingly raised up to God, and on his breast under his robe he bore an icon of the all pure Theotokos with the Pre-eternal Christ Child standing and holding the Cross in His hands. Niketas carried this icon because the Holy Theotokos had appeared to him and comforted him. They threw him into a fire, and he died on September 15, 372. 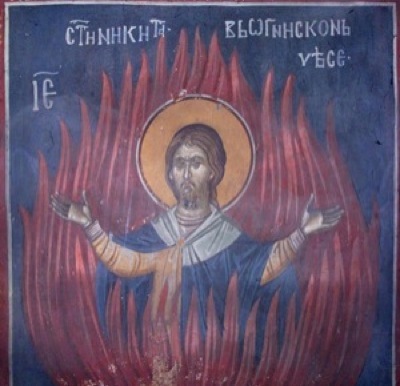 His body remained unharmed by the fire and was illumined by a miraculous light. 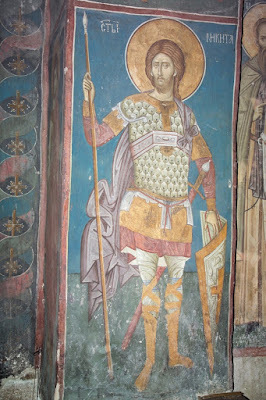 By night, a friend of the Martyr, a Christian named Marianus, retrieved Saint Niketas’ body from the land of the Goths (Wallachia and Bessarabia) to the town of Mopsuestia where he buried it. Afterwards, it was transferred to Constantinople where a church was built in his honor. 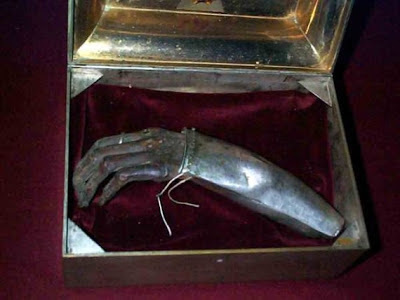 Part of the relics of the Great Martyr Niketas was later transferred to the Monastery of Vysokie Dechani in Serbia where his incorrupt hand works many miracles. We pray to Saint Niketas for the preservation of children from birth defects. "Yesterday we celebrated the Elevation of the Holy Cross, which is the unconquerable emblem of victory; today, we venerate Saint Niketas, whose name means 'one who conquers'. 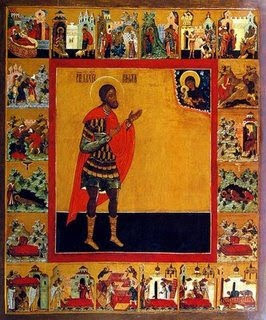 After the token of victory, the honorable and life-giving Cross of the Lord, had been exalted over the whole world, the namesake of victory, Saint Niketas, marched beneath the sacred emblem. This good soldier of Jesus Christ took his stand beneath the Cross as if it were a banner, that he might war against the enemies of the holy Cross, glorifying Him Who was crucified upon it. 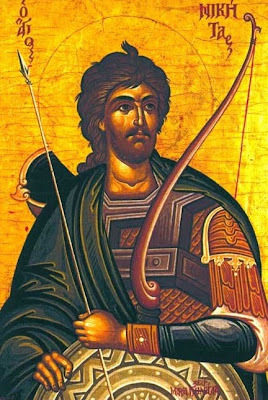 One soldier fights for the sake of an earthly king, another to protect himself to win empty glory, yet another to acquire fleeting riches; but Saint Niketas fought only for his only Lord, Jesus Christ, Who is the King of all creation, our glory and never-failing treasure." * Niketas was instructed in the Orthodox faith by Bishop Urphilus (Ulfilas, 311-383). Urphilus was a native of Cappadocia, who had been captured by the Goths. He was on an embassy to Constantinople when Eusebius of Nicomedia consecrated him bishop of the Goths (341). He died in 383. Besides translating the Scriptures into the Gothic language, he worked hard for the conversion of the Germanic peoples but, since he belonged to the "homoiousian" party of moderate Arians, he bore some responsibility for the converted Goths siding with the heretics. St. Niketas was his disciple when Urphilus was still Orthodox, and he continued the work of spreading the faith among the Goths. Thou didst defeat error and triumph in martyrdom, Niketas namesake of victory: for thou didst conquer the ranks of the enemy and end thy contest by fire. Pray to Christ our God to grant us His great mercy. 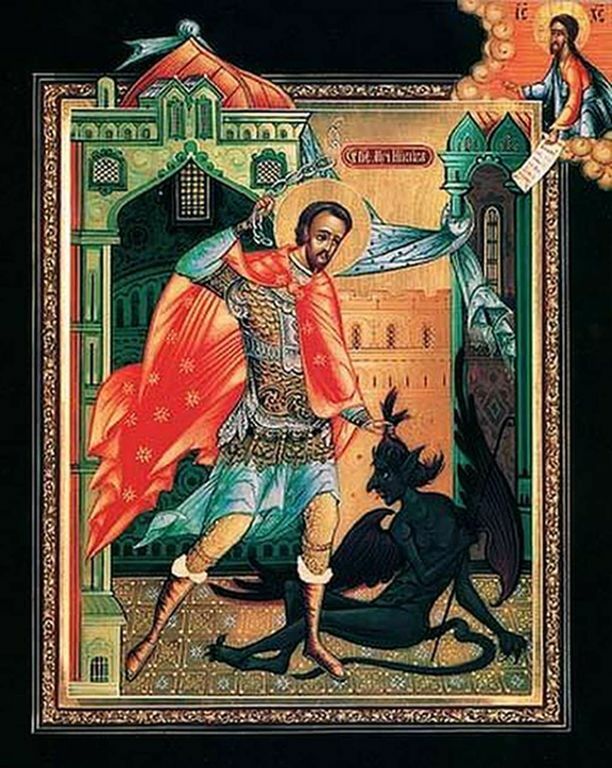 Thou didst stand firm and defeat delusion and hast received thy Martyr's crown, O Niketas, namesake of victory; thou art rejoicing with the Angels. Together with them pray unceasingly to Christ our God to save our souls. Erects a true altar to the Living Lord. And offered sacrifices to lifeless idols. Was a preacher of eternal salvation. Dispersing the idolatrous darkness that shrouded souls. And his brave endurance amazed his people. And filled all the people with the fear of God. And his spirit was raised up to the heavenly courts. But, not even today, has he been consumed. And they glorified Niketas, their wonderful one. And you stand in the royal courts with the angels. That He grant our souls mercy. On this day we also commemorate the Holy Martyrs who contested with Nikitas. Barbarically cast away to the beasts.